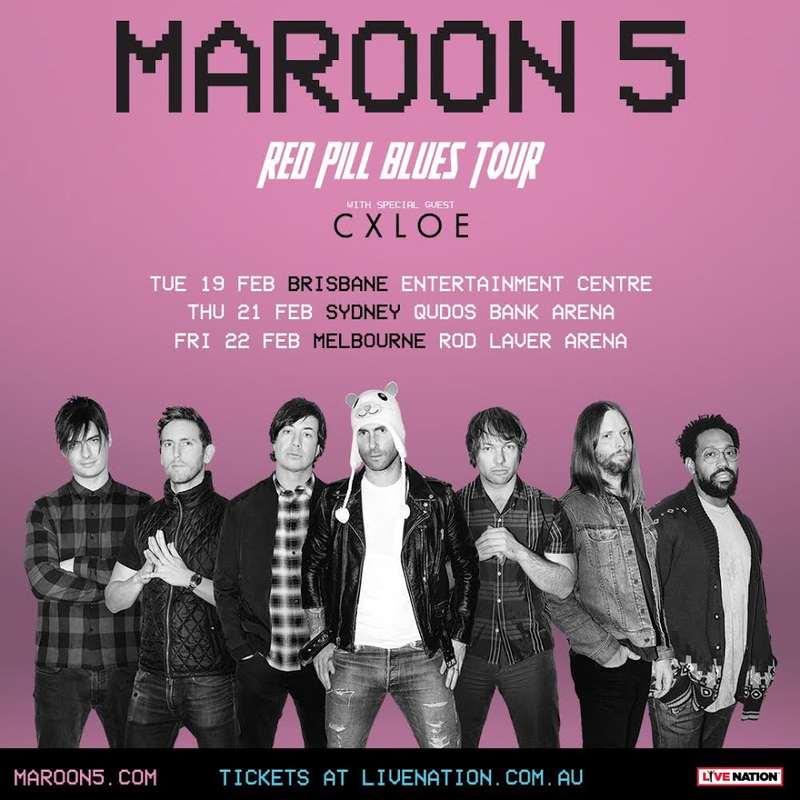 Three-time GRAMMY® Award-winning multi-platinum band MAROON 5 has announced rising Sydney star CXLOE as special guest on their RED PILL BLUES WORLD TOUR when it hits Australia in February 2019 for three exclusive concerts. The band will play live at Brisbane’s Entertainment Centre on February 19, Sydney’s Qudos Bank Arena on February 21 and Melbourne’s Rod Laver Arena on February 22, with tickets on sale now. For complete tour and ticket information, visit: livenation.com.au. CXLOE has just released new single ‘Show You’ globally, following on from streaming hits ‘Monster’ and ‘Tough Love’. Wandering between alternative and electronic, her pop sensibility brings the two diverse genres together to create a sound all of her own; a pure musical aesthetic met with complex and dark lyrics brings a true contrast to her artistry. Written in Los Angeles by CXLOE with Max Farrar and Maroon 5’s Sam Farrar, ‘Show You’ bursts with emotion from its opening chords and follows with lifting moments that will put listeners’ hair on end. Sonically exploring the notion of being vulnerable enough to let your guard down and allowing someone into your world, the soaring and emotive production – paired with CXLOE’s ranging vocals – captures an unstoppable alt-pop anthem. Maroon 5 stand out as not only one of pop music’s most enduring artists, but also one of the 21st century’s biggest acts. To date, the universally renowned Los Angeles band have achieved three GRAMMY® Awards and become “the most successful group in the history of the Billboard Hot 100” with 12 Top 10 entries, earned 20 Top 40 hits making them the only band to ever do so, sold over 36 million albums, 48 million singles worldwide, and earned gold and platinum certifications in more than 35 countries. The band won over fans and critics alike with the hybrid rock/R&B sound they introduced on their debut album, “Songs About Jane” and their double platinum album, “It Won't be Soon Before Long”. Maroon 5 went on to release studio albums, “Hands All Over”, which featured the anthemic ‘Moves Like Jagger,’ and ‘Overexposed’. The band’s fifth studio album, “V”, debuted at #1 on Billboard’s Top 200 chart and featured the #1 hit singles ‘Maps,’ ‘Animals’ and ‘Sugar,’ helping the band set a record for the most #1’s by a group in the Top 40 chart’s 20-year history, with 9 in total. The music video for the album’s GRAMMY- nominated single ‘Sugar’ has notably logged a record setting 2+ billion views to date.